Finches Barn01263 715779work01603 870304fax Self-cateringFinches Barn is a barn conversion with a wealth of period features and exposed beams and is situated on the West Norfolk Coast in the village of Choseley, where you will find unspoilt countryside and just 2 miles to the sandy beaches. Front view of property with gravelled parking area. 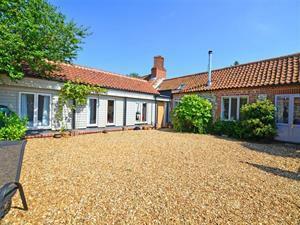 Finches Barn is a barn conversion with a wealth of period features and exposed beams and is situated on the West Norfolk Coast in the village of Choseley, where you will find unspoilt countryside and just 2 miles to the sandy beaches.